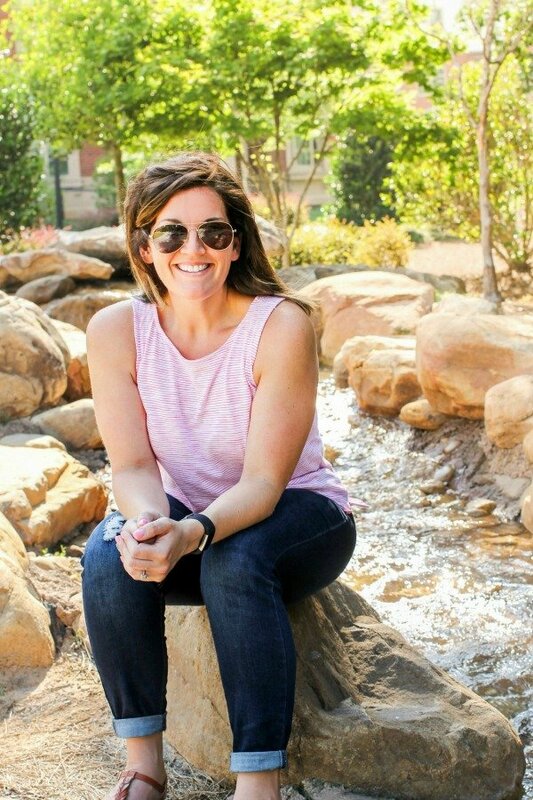 April 8, 2019 By Allyson 12 Comments This post may contain affiliate links. Read my disclosure policy. 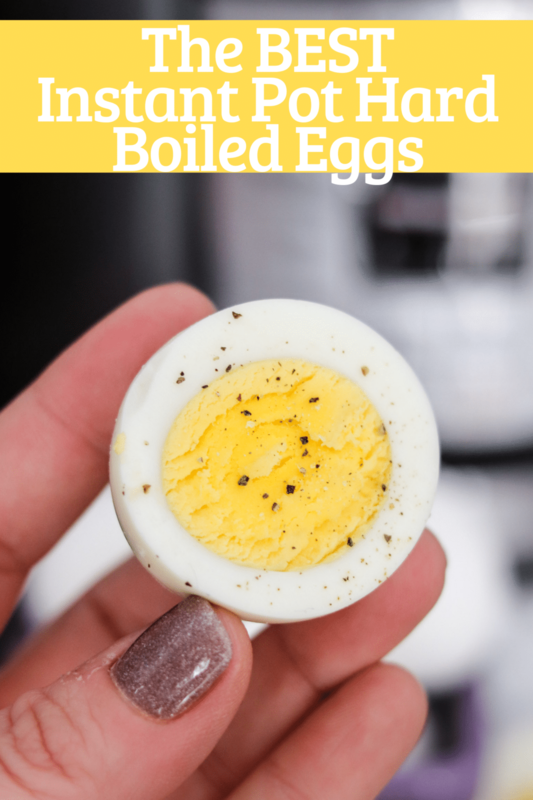 Instant Pot Hard Boiled Eggs are so easy to make and take little effort and time! Since I learned how to make them in the Instant pot, I will never make them any other way; it’s just too easy! I love using my instant pot for other easy meals too, like Bang Bang Chicken or Thai Coconut Soup– YUM! Grab the Instant Pot and get ready to whip these up! Using a 6 or 8 quart Instant Pot, add 1 cup of water to the bottom, then place the trivet or rack in the bottom of the pot. Place medium or large eggs on the trivet. I usually make up to 8 in my 6 quart instant pot, but you can add more or less. Close the lid and make sure the pressure valve is in the sealed position. Set the pot on high or manual pressure, for 4 minutes. You should remember when using the Instant Pot, that the time it takes to cook the recipe (4 mins), is not the total time of the recipe. You need to give the pot some time to ‘come to pressure’. Since there isn’t much liquid, this should take 5-10 minutes. Once the time is up, let the pot sit for 5 minutes. Once 5 minutes is up, flip the sealed valve to release the pressure. Be careful as steam will come out of the valve. While the pressure is releasing, fill a medium size bowl with water and ice cubes. Remove the top from the Instant Pot and then carefully remove the eggs and place them into the ice bath. Set the timer for 5 minutes. Once they have sat for 5 minutes, go ahead and remove them from the water. Peel and serve or place in the fridge and store until ready to eat! 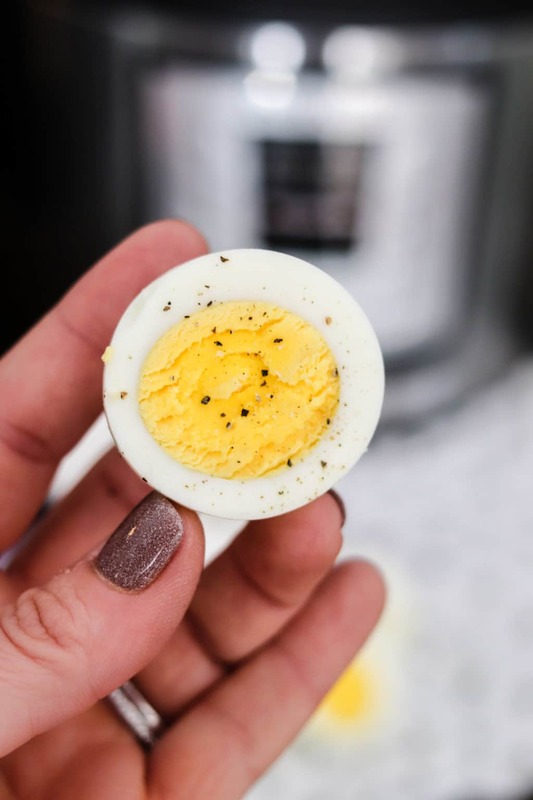 Are Instant Pot Hard Boiled Eggs Healthy? YES! One large egg contains 80 calories, 5g fat, 1g carbohydrates, and 6g protein! One egg contains over 10 percent of your daily recommended Vitamin D intake! Hard-boiling and poaching have shown to be the healthiest methods of preparing eggs, as they don’t require oil or butter for cooking. Hard boiled eggs are LOW CARB (KETO/Southbeach friendly), gluten free, Paleo approved, Whole30 approved, and are vegetarian! Eggs contain phosphorus, vitamin B12, and essential amino acids. Eggs also contain 15% of your daily riboflavin intake and also include folate, iron, vitamin B6, and zinc! How long do Hard Boiled Eggs keep in the fridge? It’s recommended not to keep eggs over a week in the fridge. I prep as many as I will need for the week and eat them throughout the week. Place eggs in a glass bowl and pour boiling water over the top of the eggs (keep eggs in shell). Let sit for 5-10 minutes then remove the shell and eat. Do NOT reheat eggs in the microwave- they will EXPLODE! 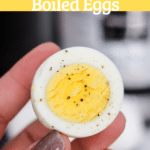 How to use Instant Pot Hard Boiled eggs? Avocado Egg Salad! Use healthy avocados and hard boiled eggs to make a delicious no-mayo egg salad! Use the egg salad in sandwiches or in lettuce wraps for a lower carb option! Potato Salad is delicious at a BBQ! Cut up the Instant Pot Hard Boiled Eggs and use them in a potato salad! Add chopped hard boiled eggs to this delicious Southwestern Salad! Perfect filling healthy meal! Creamy Pesto Caprese Potato Salad is a delicious spring and summer salad that is lightened up with Greek Yogurt! Add hard boiled eggs chopped up for extra protein! Instant Pot Thai Coconut Soup is a delicious, comforting vegetarian Thai recipe which takes less than 10 minutes to cook! Includes tofu or chicken options! Instant Pot Thai Lettuce Wraps (pork or chicken) can be made with pork or chicken in the instant pot or slow cooker! Juicy pork or chicken covered in an easy Thai peanut sauce makes the perfect healthy easy dinner! Using a 6 or 8 quart Instant Pot, add 1 cup of water to the pot, then place the trivet or rack in the bottom of the pot. Place 8 medium or large eggs on the trivet. **you can add more or less** Close the lid and make sure the pressure valve is in the sealed position. Set the instant pot on high or manual pressure, for 4 minutes. Fill a medium size bowl with cold water and ice cubes. 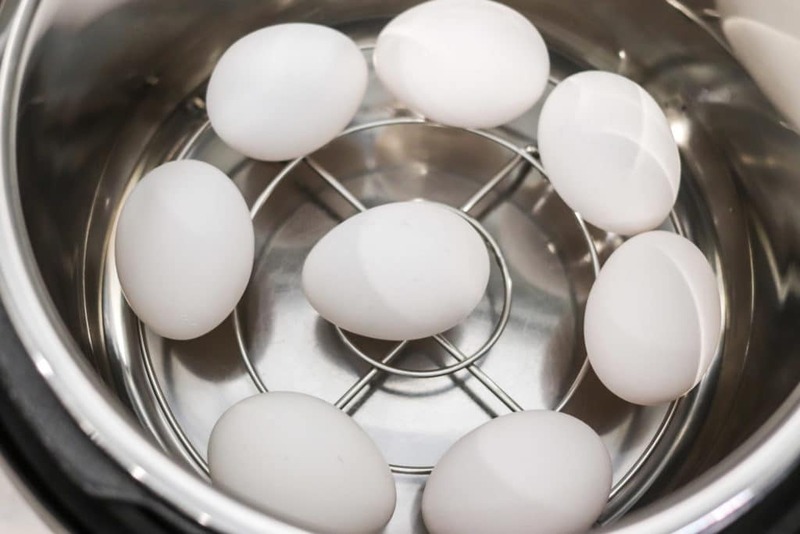 Remove the top from the Instant Pot and then carefully remove the eggs and place them into the ice bath. Set the timer for 5 minutes. Remove them from the water. Peel and serve or place in the fridge and store until ready to eat up to one week. Eggs will stay fresh for 7 days in the fridge. These are seriously amazing, Peeled perfectly. These eggs really do come out perfectly! I make them weekly! This is awesome! My favorite way to cook hard boiled eggs! Making hard boiled eggs in the Instant Pot has been life changing! I love how easy they are to peel! 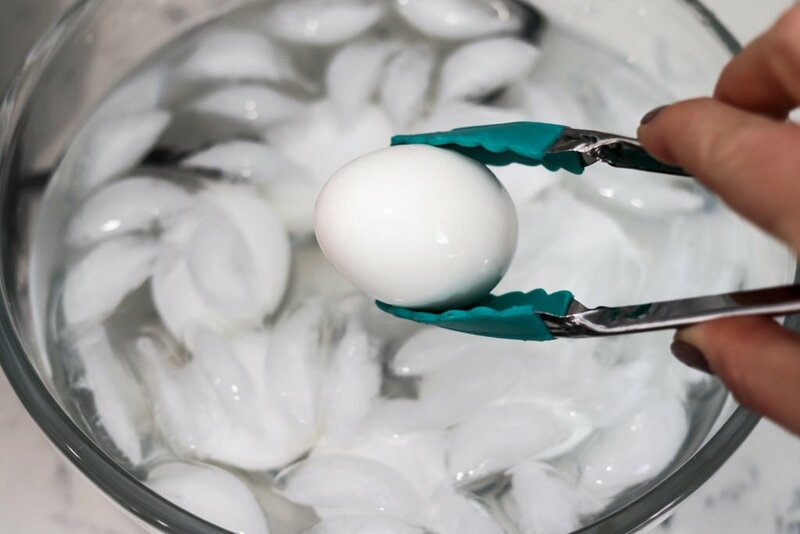 Best way to make hard-boiled eggs! Crazy easy and it works!! Best and easiest peeling eggs ever! 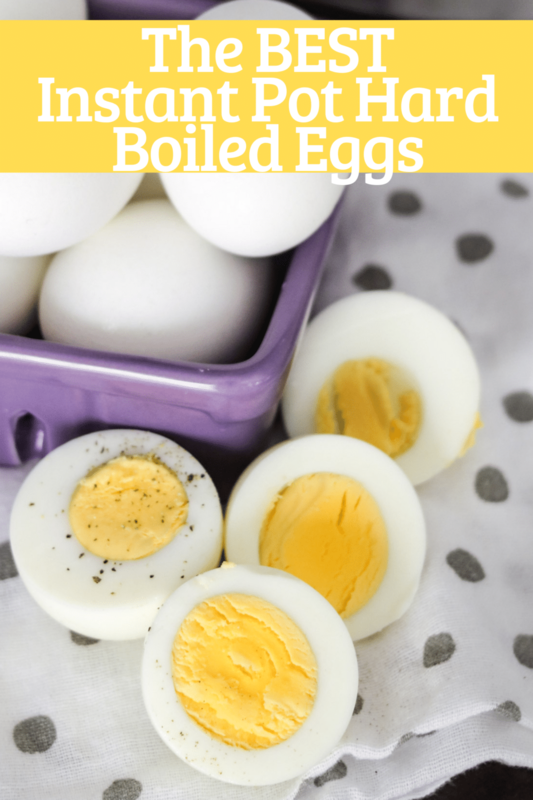 This is the easiest way to make hardboiled eggs! 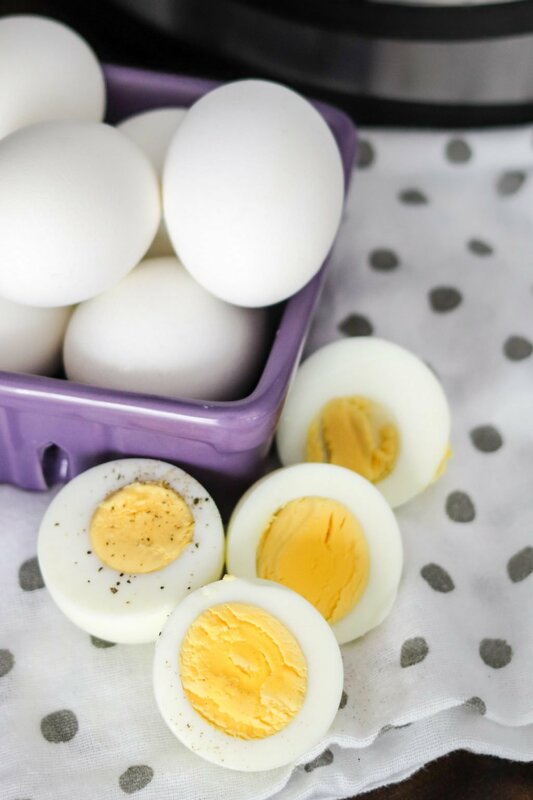 The easiest way to make hard boiled eggs! Love them! I adore hard boiled eggs! I don’t make them as often as I should, but the IP sure does simplify things!